Back in the early days of Block Party, Ben took a bunch of the small cubes we’d acquired to turn into minis and painted them single colors, calling them pixel blocks. 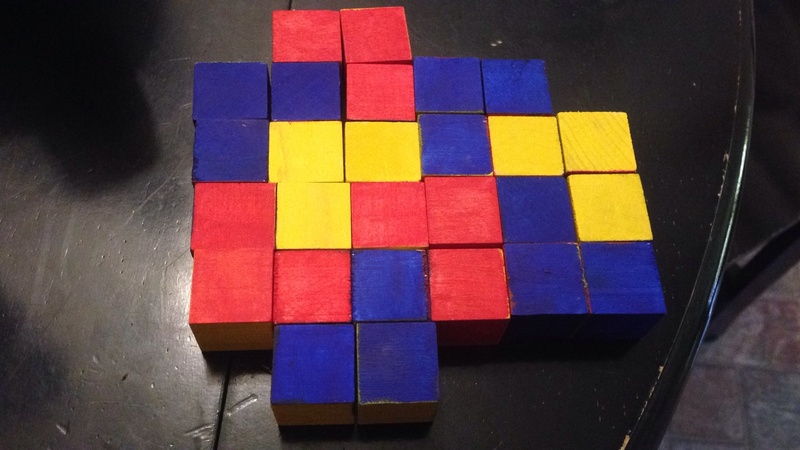 Being me, obsessed with only the thing at hand (Block Party) and unwilling to dedicate cycles to think about things not directly relating to it, I dismissed pixel blocks as something Ben’s artistic side fancied and not much more (bad job at input, past self!). Yesterday I began thinking of games that could be played with less information than complete block party glyphs, and possibly result in an easier manufacturing process as well. 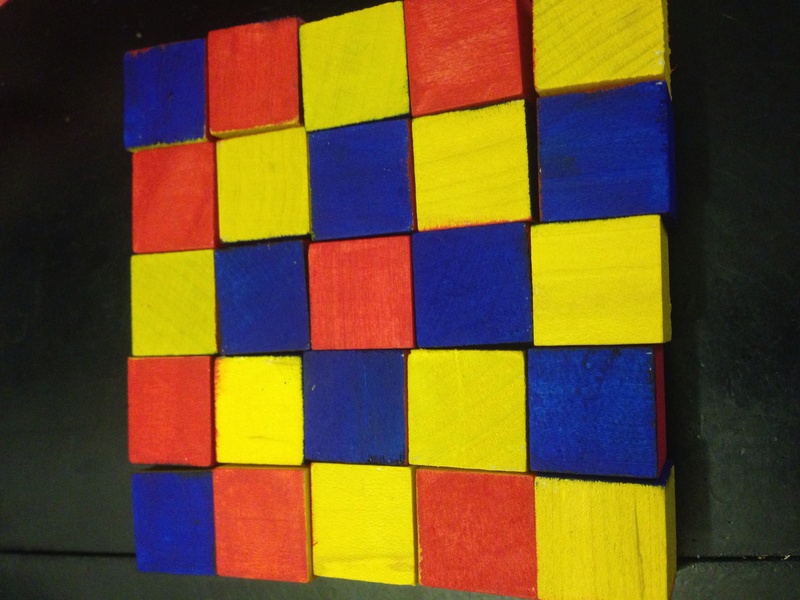 Attached are pictures of the first prototype which features 28 cubes and 3 colors where each cube has a unique distribution of colors (and this is all of the distributions over 3 colors and 6 faces–check the math for yourself!). 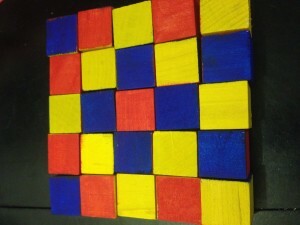 Not entirely sure about gameplay yet since 28 cubes is a little small and 3 colors is really minimal on information, but there are no doubt some fun solitaire puzzles with these pieces. 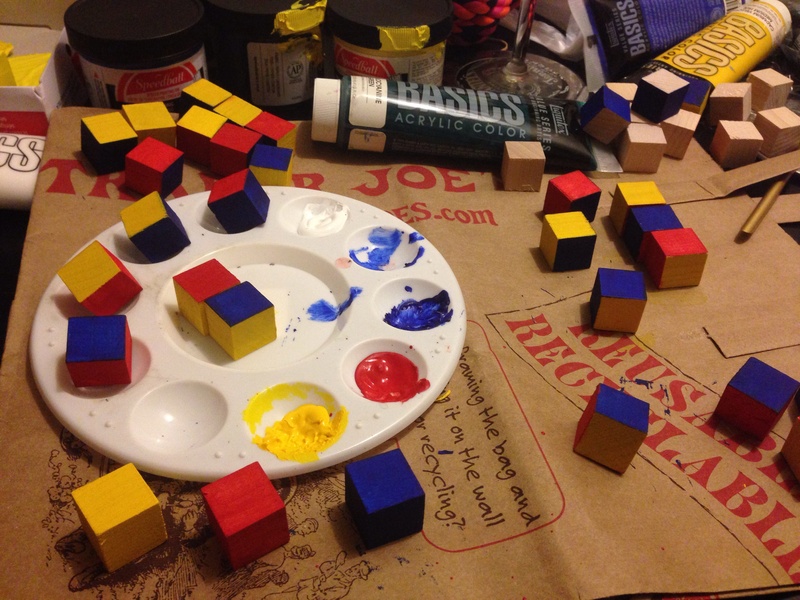 The set with 4 colors might be more interesting, though iirc it requires 84 cubes to be complete, and I didn’t feel like painting that many by hand. Perhaps another day. Moral of this story? Listen to your partner and take time to have thoughts that are outside of the narrow box that might be your primary line of inquiry.